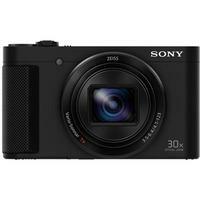 The Sony Cyber-Shot HX90 is the world's most compact camera to date to boast a huge 30x optical zoom Zeiss Vario-Sonnar T* lens (24-720mm) and retractable OLED Tru-finder. Despite the HX90's pocket-sized dimensions, it benefits from Sony's powerful 5-axis image stabilisation system, fast BIONZ X processor, built-in Wi-Fi/NFC and a 3.0" LCD that tilts upward for easy framing and low-angle shots. This travel-friendly compact is big on picture quality and comes with a raft of technologies and easy-to-use pro-style functions to deliver stunning pictures and clear Full HD movies with ease.